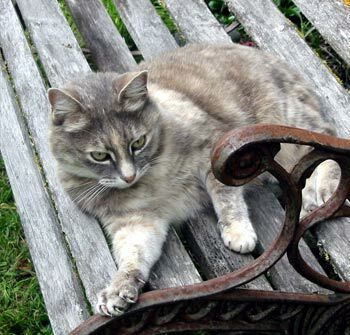 This garden bench was the very first garden seat that I purchased. It started life as a summer lunch spot, positioned under newly planted Oaks and original Tagaste trees (tree lucernes) in the Pond Paddock. There was a view of the pond, and you could hear the frogs (when they could be bothered to make noise). All in all it was a heavenly rural spot - with back support! It was an especially nice place to sit when the sheep were in the small paddock above the pond. The sheep fence was see-through, so there was much idyllic pastoral ambience, with contented bleating and baa-ing, as the sheep munched their way past. Then in the winter of 2000 the park bench was borrowed for a stage play. On its return I repositioned it in a totally different area of the garden - over the water race in a semi-circular area of roughly mown grass, near a Pittosporum tree. My new Dog-Path Garden was under contruction nearby. By default this became its permanent spot. At the time, developing the Dog-Path Gardens, I seemed to be forever digging, and needed somewhere close by to rest up. The park bench became the perfect place to sit and relax after my serious planting sessions. Things that happen by chance often prove to have the best outcomes. 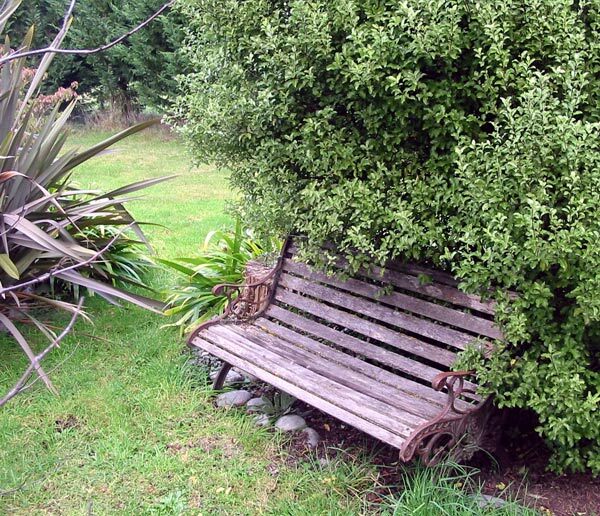 So here the park bench has stayed, while the plants and trees around it have grown more and more, year after year. It soon became completely enclosed by the greenery of surrounding Pittosporums and mass plantings of Iris Japonica.. 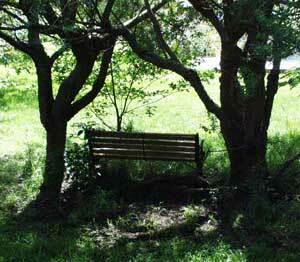 I used to sit here in full sunshine, listening to the sound of the water in the water race quietly gurgling. 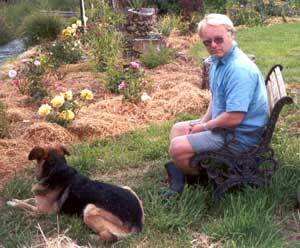 I'd look over the Dog-Path Garden, with its roses nestling in their pea-straw mulch. Those roses had everything they need - warmth, love, and fresh air. I enjoyed the views back down towards Middle Border. How well the new trees were growing, and how beautiful they all looked! In summer there were echoes of warm gold from the Golden Elm at the Dog-Path Garden's widest point. The little Dogwood looked beautiful with its variegated leaves. Directly in front of the seat was the most beautiful Cercis Forest Pansy, a small specimen tree with deep rich wine red leaves. Taj-dog and Non-Gardening Partner would often be found here enjoying the garden bench. They both seemed to read a lot of newspapers here, particularly in the weekends. And so, as the plants and trees grew, there was a much more enclosed feel to this garden spot. Look how small the rose bushes are in this archive photograph! How many of these early roses stayed in their original positions? Well - not so many, as it happens.! I've always enjoyed the back support that a 'park bench' gives to a tired old gardener, relaxing with a good book and a purring cat. When Jerome the grey was alive I could never sit down here for more than five minutes without her finding me. How do cats do that? The gardens over the water race were her favourite places, and she had no fear of crossing the wobbly Plank or one of the other bridges to get here. Dear Jerome. After many years left outside in all weathers the seat battens started breaking and had to be replaced. 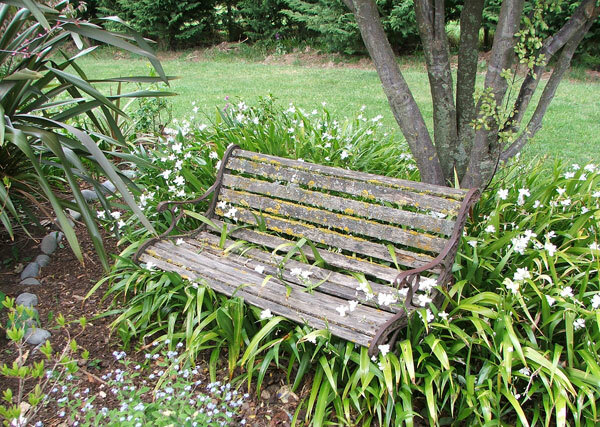 But I left the seat here, under that same Pittosporum tree, in that same patch of Japanese irises, now looking rather rustic. But I wouldn't dare sit down! All's well that ends well. The park bench has been mended now. I can sink slowly down knowing that there'll be nothing cracking or breaking underneath! The nearby garden features have changed a lot from the early days, though, Now it sits alongside a brick path which leads in to a circular brick courtyard. The Copper Beech tree is getting huge while the Cercis Forest Pansy is sulking and doesn't really do much. 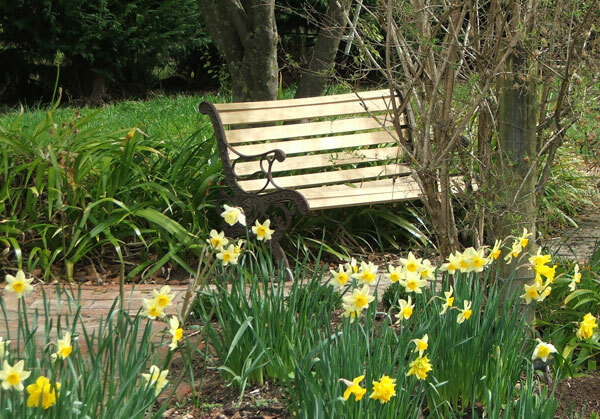 The gardens are not so rosy now, either, since the summer is more shady, but the spring garden is alive with deciduous Azaleas and daffodils. 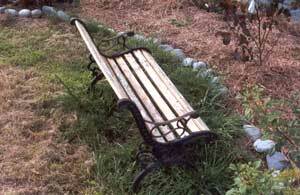 Long live my original park bench!